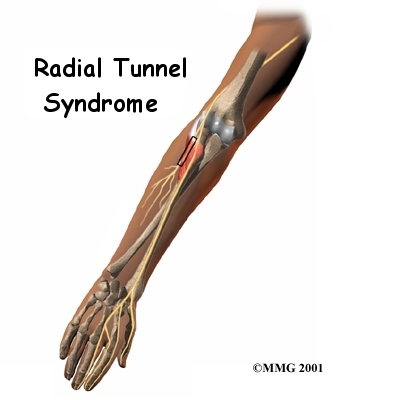 Welcome to Purposed Physical Therapy's patient resource about Radial tunnel syndrome. 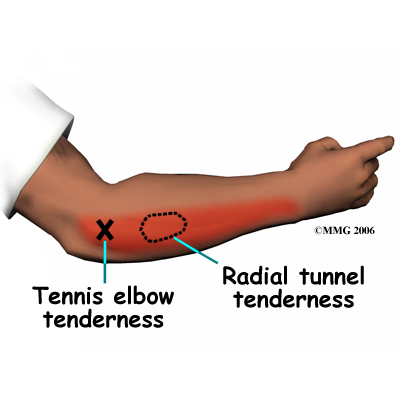 One difference between radial tunnel syndrome and tennis elbow is the exact location of the pain. In tennis elbow, the pain starts where the tendon attaches to the lateral epicondyle. 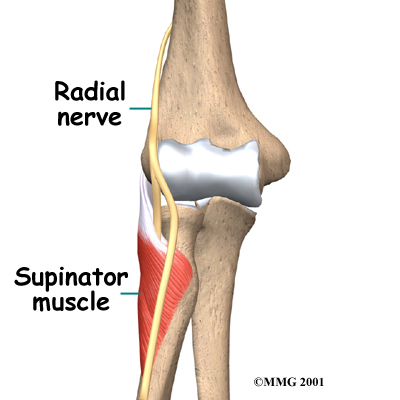 In radial tunnel syndrome, the pain is centered about two inches further down the arm, over the spot where the radial nerve goes under the supinator muscle. 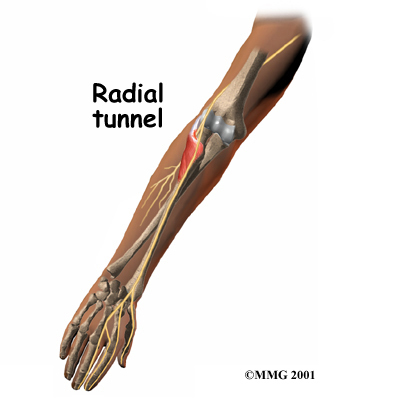 Radial tunnel syndrome may also cause a more achy type of pain or fatigue in the muscles of the forearm. 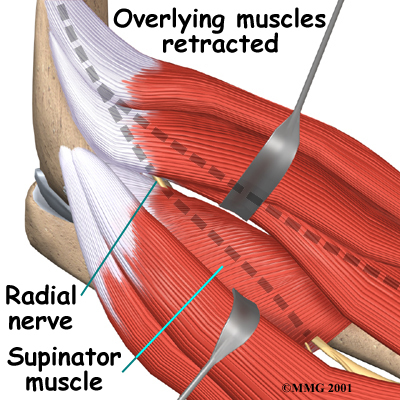 Nerve pressure inside the radial tunnel leads to weakness in the muscles on the back of the forearm and wrist, making it difficult to steady the wrist when grasping and lifting. It can even lead to wrist drop, meaning the back of the hand can't be cocked up. Skin sensation is not changed because the sensory portion of the radial nerve branches off above the elbow and does not enter the radial tunnel. The diagnosis of radial tunnel syndrome can be difficult. Many cases are initially diagnosed as tennis elbow. Tests don't always help tell the two conditions apart. When your first visit Purposed Physical Therapy, our Physical Therapist will take a detailed medical history. You will be asked questions about your pain, your activities, and any past injuries to your elbow. Our Physical Therapist will then do a physical examination to look for the most painful spot. The prodding and movement may hurt. But it is important that we know exactly where and when you have pain. We will examine your neck as well as your arm, since radial tunnel symptoms may result from nerve pressure in either or both locations. Pinpointing the source of the pain will be most helpful in determining whether you have radial tunnel syndrome or tennis elbow. Some patients may be referred to a doctor for further diagnosis. Once your diagnostic examination is complete, Purposed Physical Therapy has treatment options that will help speed your recovery, so that you can more quickly return to your active lifestyle. Treating radial tunnel syndrome can be frustrating, for you and your health care providers. Getting your symptoms under control and helping you regain the use of your elbow can be a challenge. The most important part of your treatment is to avoid the activity that caused the problem in the first place. You need to avoid repetitive activities that require your wrist to be repeatedly bent backwards. Repeated use of the wrist in twisting motions (such as using a screwdriver) also make the problem worse. If your work tasks caused your condition, you should modify your work site or your duties. This is crucial for treatment to be successful. You need to take frequent breaks as you work and play. You also need to limit heavy pushing, pulling, and grasping. Our Physical Therapist will work with you to ease your symptoms and improve elbow function. At first, we will give you tips on how to rest your elbow and how to do your activities without putting extra strain on your elbow. Ice and electrical stimulation may be applied to ease pain. If symptoms are worse at night, our Physical Therapist may recommend that you wear a lightweight plastic arm splint while you sleep. This limits your elbow movements at night and eases further irritation. The splint can help your elbow rest, giving the nerve time to recover from irritation and pressure. Exercises are used to gradually stretch and strengthen the forearm muscles. Your Physical Therapist at Purposed Physical Therapy may instruct you in special exercises to help the radial nerve glide within the radial tunnel. Treatment eventually progresses to include strengthening exercises that mimic daily and work activities. Although the time required for recovery varies, if non-surgical treatments are successful, you may see improvement in four to six weeks. You may need to continue wearing your wrist strap during the day and the elbow pad or splint at night to control symptoms. Try to do your activities using healthy body and wrist alignment. Limit activities that require repeated hand and forearm motions, heavy grasping, and twisting motions of the arm and hand. If you have surgery for radial tunnel syndrome, your elbow will be placed in a removable splint and wrapped in a bulky dressing following surgery. Although recovery time varies, you may be required to attend occupational or Physical Therapy sessions for six to eight weeks, and you should expect full recovery to take approximately three to four months. You'll most likely begin your Physical Therapy program about a week after surgery, with active forearm range-of-motion exercises. Our Physical Therapists also use ice packs, soft-tissue massage, and hands-on stretching to improve range of motion. When the stitches are removed, you may start carefully strengthening your hand and forearm by squeezing and stretching special putty. We may also recommend the use of isometric exercises to improve forearm and hand strength without straining the tissues near the radial tunnel. As you progress, our Physical Therapist will give you exercises to help strengthen and stabilize the muscles and joints in the wrist, elbow, and shoulder. Other exercises are used to improve fine motor control and dexterity of the hand. Some of the exercises you'll do are designed get your elbow working in ways that are similar to your work tasks and sport activities. We will help you find ways to do your tasks that don't put too much stress on your elbow. Before your Physical Therapy sessions end, our Physical Therapist will teach you a number of ways to avoid future problems. 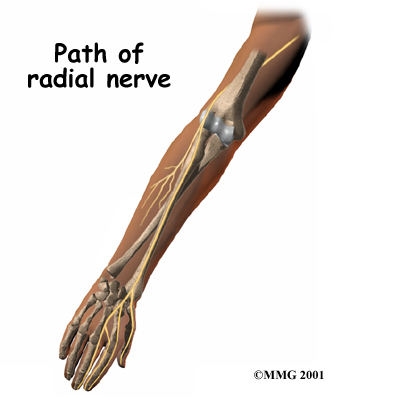 Your doctor may do some tests of the radial nerve. An electromyogram (EMG) tests to see if the muscles of the forearm are working properly. 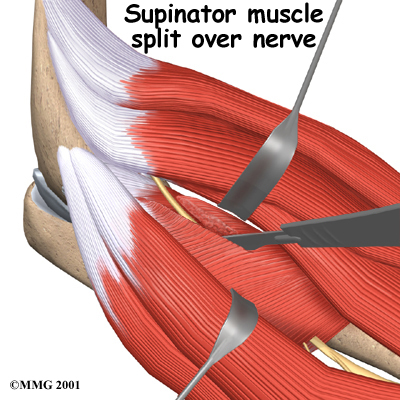 If the test shows a problem with the muscles, it may be caused by a problem with the radial nerve. The nerve conduction velocity (NCV) test measures the speed of an electrical impulse as it travels along the radial nerve. If the speed is too slow, then the nerve is probably pinched. Doctors commonly have their patients with radial tunnel syndrome work with a Physical Therapist or occupational therapist. Sometimes symptoms of radial tunnel syndrome aren't relieved, even after many months of nonsurgical treatment. In these cases, surgery may be the best treatment option. It is generally considered a last resort. 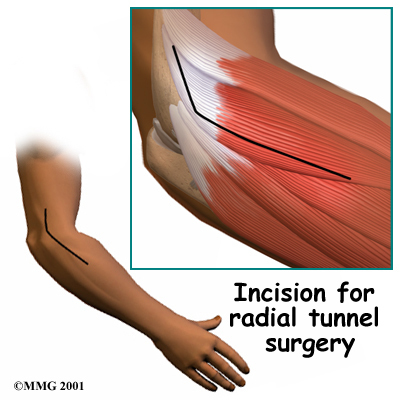 Radial tunnel surgery can usually be done as an outpatient procedure. This means you won't have to stay in the hospital overnight. Surgery can be done using a general anesthetic, which puts you to sleep, or a regional anesthetic. 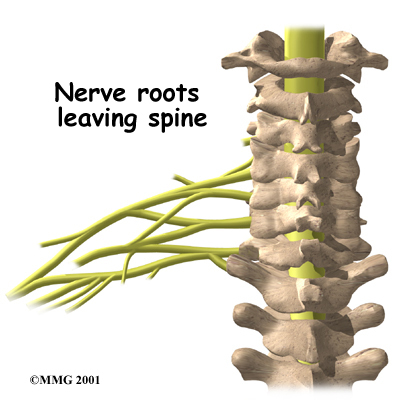 A regional anesthetic blocks nerves in only one part of your body. In this case, you would have an axillary block, which would affect only the nerves of the arm.